(a) Block M1 is just going to slide down. Draw the free body diagram for block M1 showing and identifying all the forces acting on it. (Represent M1 by a dot). (b) What is the magnitude of the frictional force on M1 if it is at rest and does not show any sign of sliding down? Justify your answer. (c) What is the magnitude of the frictional force on M1 if the mass M1 is sliding down? Justify your answer. (d) Determine the common acceleration of M1 and M2. (ii) Normal force N1 (exerted by the inclined surface) which is equal to M1g cosθ. (iii) Force of limiting static friction (Ff) which is equal to μsM1g cosθ where μs is the coefficient of static friction. (b) When the block is at rest on the inclined surface, the frictional force is equal and opposite to the component M1g sinθ of the weight of the block along the plane. So the magnitude is M1g sinθ. (c) The frictional force on M1 when it is sliding down is μkM1g cosθ since the coefficient of kinetic friction μk is to be used in this case. (a) In the condition shown in the figure, the chain is just going to slide up the incline. Obtain an expression for the overhanging length ℓ of the chain in terms of the given parameters. (b) If the chain were just going to slide down the incline, will the value of the overhanging length ℓ of the chain be different from the value obtained in part (a)? (i) Yes_____ (ii) No_____ (iii) The answer will depend on the angle of the plane. 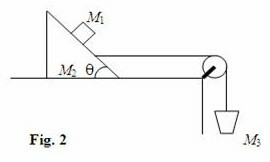 (c) If there is no friction between the chain and the inclined plane, determine the value of the overhanging length ℓ of the chain that will make it just start sliding down the plane. (d) When the chain is let free it slides along the table. Take the point A (initial position of the end of the chain) as the origin and write a differential equation for the acceleration of the chain at any instant during its motion. (e) Solve the differential equation obtained in part (d) and determine the velocity of the chain when the end A just leaves the edge of the table. [Note that the normal force exerted by the plane on the chain is (L – ℓ)mg cosθ and μ is the coefficient of static friction]. (b) If the chain were just going to slide down the incline, the value of the overhanging length ℓ of the chain will be less than the value obtained in part (a). This is because of the fact that the frictional force will oppose the component of the weight of the portion of the chain that tries to move the chain down the plane. Or, Hmg = (L – x)m (dv/dt) where v is the velocity of the portion of the chain on the table. The vertical portion also is moving and hence the total mass moved is that of length (L – x). This is the required differential equation for the acceleration (dv/dt) of the chain. where C is the constant of integration which can be found from the initial conditions.